I was so excited to realize this morning that Christmas is just 25 days away! I hope you all had a wonderful Thanksgiving weekend! We had some nice weather, so we were able to work in our yard this weekend after enjoying the awesome Mizzou/Arkansas game on Friday. Between Black Friday shopping on Thanksgiving night and the Cyber Monday sales today, I have Christmas shopping on the brain! I already bought one present for Trey, so I'm weighing some other ideas to fill out his gifts. 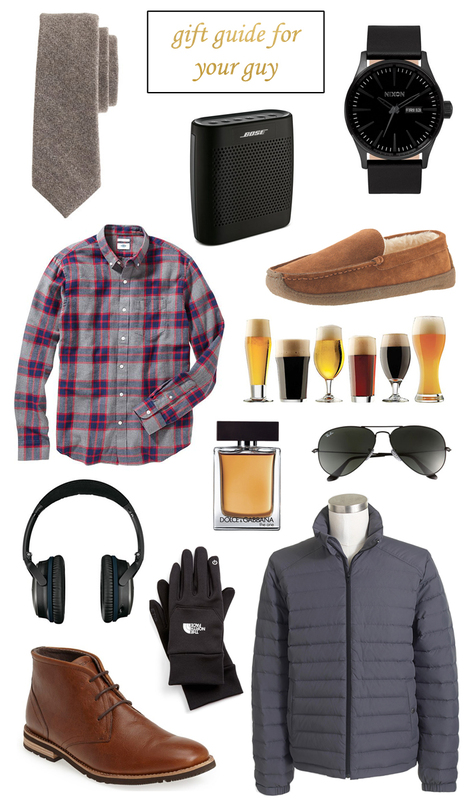 Guys can be really hard to shop for, so I wanted to put together this guide (and I included some extra ideas below)! In the past Trey has enjoyed getting Beats headphones, brown boots (his are suede but I like the leather above too), Nike tennis shoes (always), the craft beer glass set above, and bluetooth speakers (we have the Sonos).